Gravel retention systems are designed to prevent the dispersal and migration of gravel in pedestrian or vehicle traffic applications. Cellular grass protection systems are infilled with soil to promote grass growth. 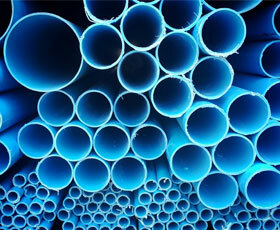 Both products provide a firm and free draining surface, which is SuDS compliant and eco-friendly. Grids should not buckle or pull apart when subject to continuous and heavy weight use so various cell sizes are available depending on the application. Typical uses include occasional car parks, access lanes, caravan hard standing, paths, event areas, golf courses and residential pathways. 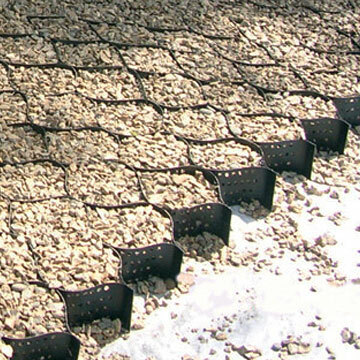 At Civils and Lintels we work with Pennine Manufacturing to bring you a comprehensive range of cellular gravel retention and grass protection systems. Wrekin Cell Track – This system is specifically designed to allow the development and extension of vehicular access areas in aesthetically sensitive locations. Manufactured with ease of installation in mind, Celltrack can be used with a variety of fill materials, allowing developers to build new access areas such as roads and car parks, which are both pleasing to the eye and consistent with the existing environment. Celltrack is a permanent panelled system that is virtually invisible once infilled. Designed for quick and easy installation, panels simply interlock together and incorporate small ground spikes which provide anchorage during installation. Celltrack can be in-filled with soil to promote grass growth or gravel to create decorative driveways and paths. Pennine Ecoblock – The Ecoblock range has many benefits, including the lightweight material and self-fastening connectors, making the grids quick and easy to transport, handle and install. Manufactured from durable UV stabilised High Density Polyethylene (HDPE), they are a robust, enduring solution for all your ground reinforcing needs. They are also eco-friendly, as the material is 100% recycled and chemically inert, so can be placed on the ground without long-term damage to the surrounding soil. The Ecoblock 39 ground reinforcement mat enables easy and rapid installation of substructures to many home landscaping projects. Ecoblock 45 is ideal for pedestrian and occasional vehicular use, for use in applications such as reinforcing hardstandings, footpaths, verges, bridge abutments and access roads. Ecoblock 70 is suitable for areas where there is freestanding or flowing vehicular traffic. The Ecoblock Heavy is perfect for areas where there is freestanding or flowing HGV traffic, for instance for reinforcing HGV carparks and truck stops. 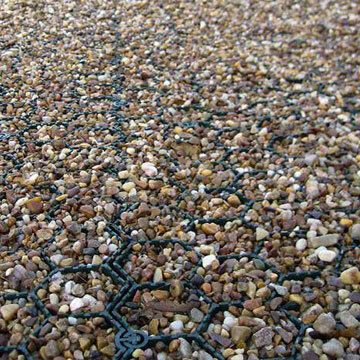 If you need gravel retention or grass protection products for your next project, contact your local branch.